Breakfast at the hotel. 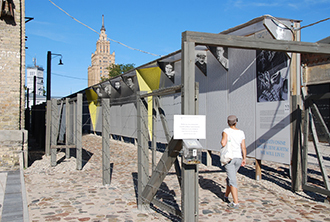 This morning, embark on a full day tour of Jewish Riga, including the Jewish Quarter, “Alt-Neu Shul” (Old-New Synagogue), and moving Memorial to the former Great Synagogue, which burned to the ground. You will also stand by the wall honoring the Righteous among the Nations. Learn the fascinating story of Jannis Lipke, a heroic Latvian who saved many Jewish people. 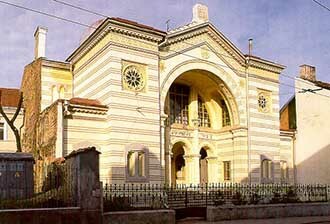 You will also enjoy a museum exhibit on the history of Jews in this part of the world. Next, a visit to Riga’s Jewish Community Center, splendidly housed in a former theatre, museum “Jews in Latvia”. Afterwards continue to chic “Art Nouveau” district, where many prominent Jewish Latvians, among them the philosopher Sir Isaiah Berlin, once lived. Overnight at the hotel Gallery Park 5* or similar. Breakfast at the hotel. Departure from Riga with en route stop at Rumbula memorial, honoring the Jews of Latvia, Germany, and Czechoslovakia. Further –Baltic baroque masterpiece – Rundale Palace. Afterwards – arrival to Lithuania. Lunch at “Audruvis” restaurant. First site is a small town ofJoniskis, where you will see complex of 2 synagogues, built in classicism and neo gothic style. Continue to Kedainiai. It is a citadel of Radzivil family, one of the most powerful nobility in late middle age Lithuania and also a town where the Vilna Gaon lived and worked and where 3 synagogues have remained. Visit Kedainiai multicultural center, established in one of the synagogues. Trip to Kaunas. Visit Sugihara house. Sugihara was a Japanese diplomat who (like a Shogun Schindler) bravely saved hundreds of Jews. After this special visit awaits dinner in restaurant “Senieji rusiai” together with representative of Kaunas Jewish community. Overnigh at the hotel “Daugirdas” 4* or similar. Breakfast at the hotel. Get to know Kaunas – second largest city and the capital of Lithuania between the World Wars. Tour of Kaunas, including the notorious Ninth Fort, where 30,000 Jews were murdered. 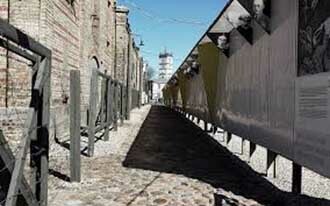 You will also visit the former Kaunas Ghetto and Monument, as well as the splendid Chorale Synagogue. Continue to Trakai – the capital of the Grand Duchy of Lithuania, a majestic insular castle of 15th century. Enjoy the panoramic view of the castle and learn about local ethnic minority – karaites. Their religion is reformed version of Judaism. Try their traditional dish – kybyns and liqueur at one of karaites restaurant “Kybynlar”. Travel to Vilnius for overnight. Hotel “Kempinski” 5* or similar. Breakfast at the hotel. Day to get acquainted with rich history and heritage of the Northern Jerusalem Vilnius. Vilna boasted dozens of packed synagogues and prestigious Jewish schools. Unlike Poland, source of the transcendent revolution of Chassidism, the “Litvak” or “Litvishe” mentality is thought to be utterly rational, based on textual analysis, precedent, and Talmudic (or legalistic) reasoning. First visit to the Choral Synagogue, the sole survivor out of more than 100 pre-war Jewish prayer houses in Vilnius. 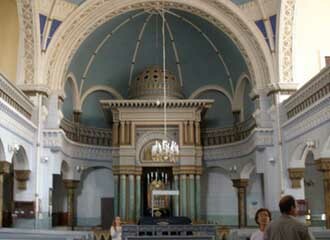 The term Choral Synagogue relates to the inclusion of a choir section, a feature considered by some to be a revolutionary form of modernisation and assimilation at the time it was built. Later continue to the beautiful Vilnius Jewish museum and art gallery as well as holocaust exposition. Visit Ponar Forest and Memorial nearby Vilnius. Amidst the delicate rustling of the poplar leaves, you will feel the presence of thousands of Jews, shot in the early days of the war – but (as proved by your visit) never forgotten. Pay respects at the Vilna Gaon’s grave in the Vilna cemetery (many come here to ask for a blessing). The Vilna Gaon is the personification of what makes the Litvishe heritage so precious; his attribute, “Gaon,” is Hebrew for sage. In the evening, let the joy of Shabbat lift your soul as you enjoy Friday Night Dinner. As is often said, “more than the Jewish people have kept the Sabbath, the Sabbath has kept the Jewish people.” Yes, it has kept them strong, united, and filled with an eternal sense of peace – Shabbat Shalom. Overnight “Kempinski” 5* hotel or similar. Breakfast at the hotel. Today is a day of rest, and your morning is at leisure to stroll around the city, or perhaps join in local Shabbat services. 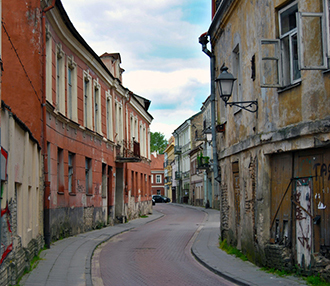 In the afternoon, embark on awalking tour through Vilna’s charming, cobblestoned Old Town. 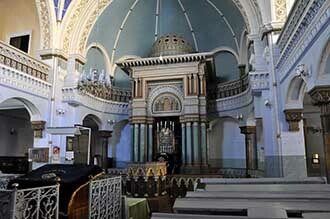 You will also see the place ofGreat Vilna synagogue, old Jewish Quarter, with its narrow streets and courtyards. Visit Vilnius University – which offers courses in Yiddish, both to Lithuanians and visitors from around the world. Lithuanian Yiddish is said to set the classical standard. Its speakers created YIVO, an organization which honors this irreplaceable heritage, born in Vilna and now in New York City. Overnight. Breakfast at the hotel. Morning departure to Belarus to visit the famous yeshivas that existed here before the Holocaust. Stop at Novogrudok. There is a museum and a memorial exhibition devoted to the Jewish resistance in the area of Novogrudok during the Holocaust. It is housed in one of the buildings of the vocational school # 193 which was used as a barracks for ghetto prisoners during the war. The memorial exhibition includes two rooms with the reconstructed barracks interior and an exhibition with the reconstructed tunnel entrance. Later continue to Mir. Here you will find medieval castle of the Dukes Radzivilas. 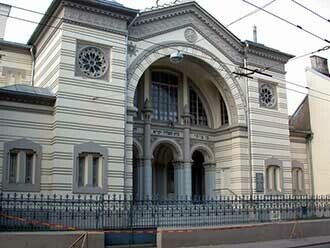 Moreover – world-known yeshiva, established in 1815 with a number of about 500 students from all over the world; four synagogues, Old Jewish cemetery, impressive memorial complex erected to commemorate the Jewish families, killed during World War II. Continue toNesvizh – one of the oldest and most mysterious cities in Belarus. Visit Nesvizh castle – UNESCO sight and one of the oldest surviving castles in Belarus and local history museum. Learn about Jewish life before the WW2 and hear about one of the first ghetto uprisings. Trop to Minsk for overnight. Hotel “Europa” 5* or similar. Breakfast at the hotel. Full day explore the secrets of Minsk. Minsk was one of the destinations in Eastern Europe where the Nazi relocated the Jews from Western Europe for extermination in the years of WWII. 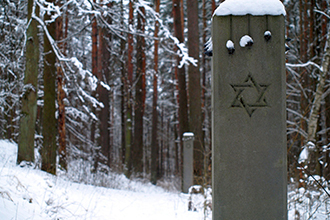 Visit the museum of history and culture of the Jews of Belarus, ghetto area, choral synagogue, Jewish community center, “Hole” memorial, old Jewish cemetery. Learn about concentration camp “Small Trostenets”, where in 1941 – 1944 more than 200 000 Jews from Belarus and Western Europe were destroyed. Overnight “Europa” 5* hotel or similar. Breakfast at the hotel. Travel to Pinsk. 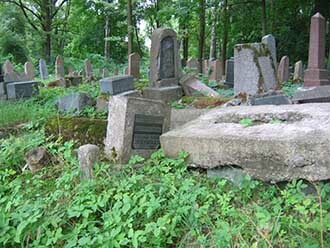 City tour includes visit to the Jewish Community center, Hassidic functioning synagogue, Old Jewish cemetery and the site of execution of Jews. See the places related to scientist and Zionist leader, first president of Israel – Khaim Weizman and first Pime-Minister of Israel – Golda Meir, who lived in Pinsk. Overnight “Europa” 5* hotel or similar. Breakfast at the hotel. Private transfer to the hotel. Departure. For the price please send us request and then we will give you exactly price !!!!! • Admission fees: Museum Jews in Latvia, Riga synagogue, Rundale palace, Kedainiai multicultural center, IX fort, Sugihara house, Kaunas synagogue, Holocaust exposition, Tolerance center, Vilnius University, Jewish museum in Minsk. For the price please send us request and then we will give you exactly price ! !